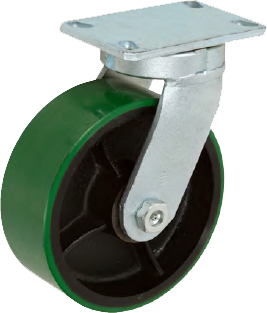 5 9/32" x 7 1/4"
3 3/8" x 5 1/4"
to 4 1/8" x 6 1/8"
Series 95-96 casters are made from forged steel. Top plate and inner raceway are forged from one piece, providing a superior raceway construction for shock conditions. This forged design outperforms the standard steel plate welded to tubular steel inner races, especially in abusive and impact-loading conditions.